Some of the best attractions in Lefkada are definitely the churches and monasteries that are scattered around the island. Historic structures that draw the attention of the visitors for their beautiful Venetian architecture, impressive frescoes and wooden domes built between the 17th and 18th century. One of the oldest Byzantine monuments of Lefkada is the church of Panagia Hodegetria. It is located close to Apolpena village, just 2 km from Chora and it was founded during the 15th century. Today the church hosts unique frescoes most of which have been transferred to the Byzantine and Christian Museum. The church of Agios Ioannis Atzoussis is an old church that is literally built into a rock, above the beach of Agios Ioannis, close to the main town. In the heart of the capital lies the church of Christou Pantocrator. It was built in 1684 by the Venetians following their victory against the Turks. The Monastery of Panagia Faneromeni is well- known as the most significant religious monument located between the capital and the village of Frynio. 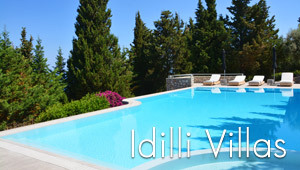 It lies on a fabulous location full of pine trees with lovely views to Agios Ioannis Frini bay. Within the monastery's premises is the Ecclesiastical Museum with valuable items and icons. In the central square is found the 17th-century church of Agios Spyridon that is strongly connected to the Venetian architecture. It is worth-seeing the tiny chapel of Agia Kyriaki, in Vlychos bay, opposite Nydri. Want to visit these beautiful churches of Lefkada? This is the most important monastery and religious center of Lefkada. It is situated in a lush green are about 2 km from Frini village. Situated 3 km west of Lefkada Town, this is the oldest church on the island. It was built by the Franks on the top of a rock, on the site where an older church used to stand. Some said that Apostle Paul once stopped here, on his way to Rome, to teach Christianity. The old church of Santa Mavra is situated inside the Castle, that is today renovated. It is made of stone and following the traditional style. The church of Panagia Hodegetria is the oldest Byzantine monument on the island. It is located in a walking distance from Apolpena village, just 2 km south of the main town. The interior of the church had some amazing frescoes, that are today hosted in the Byzantine Museum of Athens.